When we began the Sibling Discovery Project, we agreed we would not beat ourselves or each other up over missed deadlines. We also agreed to keep to our schedule for discussions. After all, the conversation and support are what this is all about … not prompt or perfect output. This short paragraph prompted a meaningful discussion. We also agreed that mom passed her ethic to all three of us. Though we may fall prey to clutter, we all appreciate that it’s easier to be productive and creative when you begin and end with clean tools and space. This is true in a kitchen, an art studio, a workshop or an office. We played with and laughed about the image of a sink-full of anything. Norma is considering loading a bunch of fabric and unfinished art pieces into her sink for a photograph. What a great reminder to get things done! 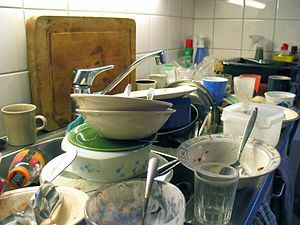 As for me, I have found that any trip to the kitchen sink now (and I visit there often!) makes me think about creativity and productivity and what I need to clear away in order to get on with what’s next. I hope Paul and Norma will comment on this post, because I realize now that the conversation was rich, and I am recalling only broken bits and pieces of it.